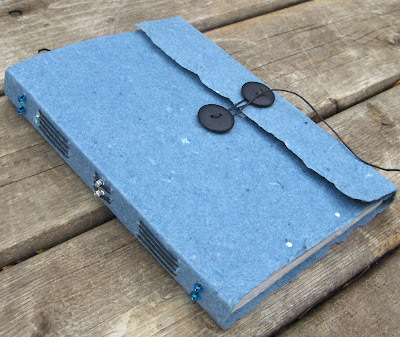 Presenting the first of the swap books to be featured this time: this book was made by Laura, PrairiePeasant.Etsy.com. 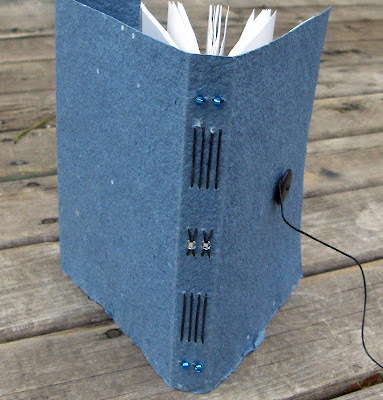 Laura says she has been playing with various St Armand papers and this small sketchbook has a really pretty blue St Armand paper for the cover, wrapping around the fore edge with the two-button closure on the front. The longstitch sewing is embellished with little beads on the spine. There are 80 pages of 70lb drawing paper inside.